We are open 7 days a week 10am until 4pm to help you get the most out of your visit. Share your enthusiasm for the Dunedin Botanic Garden with visitors from around the world. Join us to help foster interest in and promote the development of the Dunedin Botanic Garden. 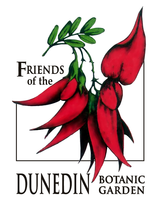 Would you like to support the next Friends' projects at the Dunedin Botanic Garden? The Gardens is always a hive of activity. Below is one of the many things available. Click on the link below for more events.